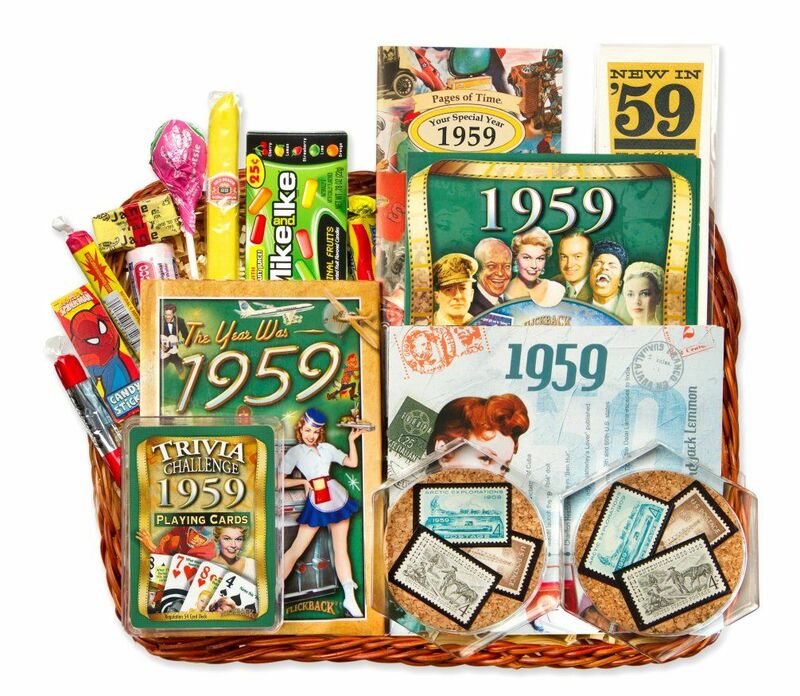 60th Birthday Gift Basket with 1959 Postage Stamps. Makes a wonderful 60th birthday gift! If you have ever thought about giving someone a basket but were daunted by making your own, here are a few ideas from our customers that might be useful. One, you can create a coupon book offering 60 chores that you will do for the other person. It might be as simple as walking the dog, or cleaning the bathroom, or as complex as painting a room. Two, you could also make an 'i love you' list of sixty items that tell different ways you love that person. List their most favorable traits, or list experiences where the person has gone above and beyond. This will make a present that will be kept for future generations and give everyone at the party real insight into the person you are celebrating. If you'd rather take an easier route, think about buying one of our many 60th birthday gift boxes- we have four different ones to choose from.